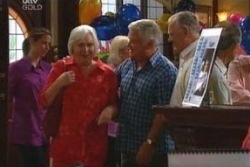 Steph's birthday in the pub – as she tells her friends that her family have become enemies, Flick is seen exiting. Darcy and Penny smooching in the hospital and getting seen by Karl. Karl is telling Susan about Darcy and Penny, adding that he thought Darcy had done everything there was to do that is “illegal, immoral, avaricious or just plain stupid”. Susan wonders if Darcy is actually in love, but Karl thinks it's just another conquest. Susan asks Karl what he's going to do about it, just as Karl says that he'll have do report Darcy to the Medical Practitioners Board, Darcy is seen just outside the slightly ajar front door, clearly able to hear the whole conversation. Karl goes on to add that with Darcy's history he has no choice. With that Darcy enters the house and asks to be allowed to give them an explanation. Harold and Rosie are just about to leave together (arm in arm) when Flick stops them asking for Tad's contact details. Harold gruffly replies that he's surprised Tad didn't give them to Flick himself, she explains that she was out when he called. They talk about what a good friend Tad was to Flick, and Flick adds that no-one else around cares. Harold tells her that she should stop feeling sorry for herself for a start. Flick leaves and Rosie then turns the tables on Harold by telling him that that wasn't very Christian of him. He tries to defend himself by re-iterating Flicks behaviour. Rosie persists and tells Harold that she still deserves compassion, and asks him if he can only be forgiving to strangers. Harold ‘aaahs' in remorse at his actions. Karl, Susan and Darcy are discussing the situation with Darcy and Penny. Karl repeats that he warned Darcy at the beginning, Darcy said he was listening but Penny is special, maybe he loves her. Karl's riposte is that Penny would have to be pretty special to risk his career over. Both Darcy and Susan try to get Karl to change his mind, but Karl is adamant. He adds that Darcy may get away with a suspension. Darcy asks how many patients would trust a doctor that had to be supervised. Karl agrees. Darcy realises he would have to undergo psych counselling, Karl points out that this may do him some good. Darcy accuses Karl of enjoying this, Karl says he not, and he's had it with Darcy. Darcy tries to change Karl's mind by saying he's sorry, but to no effect, if everything goes wrong and Penny files against Darcy, Karl would be complicit. Despite Darcy's protests that that wouldn't happen, Karl's final word is that he won't stick his neck out for Darcy, and not over this. Lou is looking through the calendar, he hides it as Harold and Rosie walk in and denies anything is wrong when Harold asks. He offers them a drink, Rosie offers to make her own tea, but Lou refuses to let her near the kitchen as she is a visitor. He asks Harold pointedly to put the kettle on. Rosie asks if Lou is a visitor as well, Lou says no, he's just busy. Harold spies the calendars and they have a frantic whispered conversation about them having been delivered to the billing address, meanwhile Rosie answers the door to Joe who has come to move the boxes to the pub. Lou tries to put him off. Rosie catches on and tells Joe that it's obviously something they don't want her to know about, and asks them if it's something she'd be angry about, or whether she should leave. They deny both of these suggestions. Joe says to let him know when the coast is clear, and Lou gets back to the tea whilst Rosie smiles wickedly. Susan finds Darcy sitting and feeling sorry for himself. He admits that Karl is right, Susan agrees, she tells him he's trying to look like the big man around town and winding up looking like a schoolboy, she tells him she's trying to help him and asks what his problem is. He flounders round ideas of low self esteem, and an unconscious desire to self destruct but admits he doesn't know – it started off as just messing around and became more. Susan warns that it had better not be just a game, Darcy says no, it's different, Susan asks how, and Darcy admits he doesn't know but maybe this time he is in love. Harold asks Flick if she managed to catch up with Tad – she has spent a couple of hours talking online to him at the internet café, and he's doing well. He then asks how she is: “Miserable job, miserable flat, no friends, no money, I'm laughing really” comes the reply. She then pointedly apologises for feeling sorry for herself. Harold invites her to stick around for a talk, but she says she doesn't want to be late for work, or they'll dock her pay. Harold keeps her behind long enough to apologise for his earlier outburst, and she leaves slightly happier. Penny is begging Karl not to report Darcy, whilst Susan is making drinks for them both. She tries her best to convince him that she was in no way vulnerable and that if anyone was manipulated into the relationship it was Darcy, also that if Darcy loses his job it will kill him but Karl is still convinced he should act and report Darcy. As Penny somehow drops an entire fridgeload of drinks, Harold asks if there's anything she needs to talk about, or if she needs time off, but she protests that she can deal with the problem, and that she needs to be doing something to distract her. She is clearly on the verge of tears, and asks Harold not to be too nice or she'll cry. Harold lets her get on. Rosie drops by to ask what's going on with him, Lou and the boxes. He tells her it's a surprise, she says she hates surprises. There is a big crash from the kitchen and Harold excuses himself to sort it out. Rosie comments that it was a lucky escape. He tells her on his way to the kitchen that he'll see her at 12:30 at the pub, she says she'd better find oit what's going on then, or there'll be hell to pay. Susan and Karl are walking into the street with atypically surreal conversation, Susan: “Yes, yes but the car is the odd one out” Karl: “ah but it could be the duck”. Rosie is weeding Harold's garden, and Lou is warning her that Harold is very fussy and won't like it. They see Karl and Susan, Susan asks if Karl should wear his toga later to the pub, not realising that Rosie is in the dark about the calendar launch. 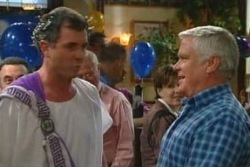 Lou tries to cover by claiming there is a meeting of the Royal Erinsborough Roman Society, and attempts to concoct some activities that such a club might get up to, as he flounders Rosie calls his bluff by asking if there are any orgies involved, and why she hasn't heard of this before. 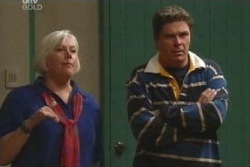 Karl and Susan then jump to the defence, Karl asserts that it is actually the Royal Erinsborough Roman Historical Re-enactment Society, Susan adds: “Yes, or as we like to call it… ‘RERHERS'…” As Karl and Susan descend to congratulating each other on such a sham of a performance, Rosie questions Lou on the connection of the previously unmentioned RERHERS and boxes. Karl still keen to keep up the pretence long after it has obviously failed mishears boxes as ‘boxers' and points out that actually it's Gladiators. Harold commiserates with Flick as she orders some food to fit into her half hour lunch break. He gives her a message from Tad about a position that's opened up on his tour, but she faces up to the fact that “that would be running away big-time”. She tells Harold that she's promised herself that she'll fix the mess she made. Harold tells her good for her. 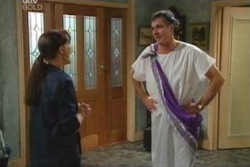 Susan tries not to laugh as Karl is wearing his toga, and becoming very embarrassed at the thought of wearing it to walk to the pub. 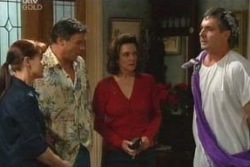 She eventually convinces him to give her a twirl, and he begins to play up to her admirations: “Do you think my bum looks big in this?” Karl answers the door to Joe and Lyn who are obviously stunned to see Karl wearing the outfit – he tells them that Susan insisted he wear it, as they begin to giggle Karl begins to defend his yet again fading ego by telling Joe that some people can carry it. The phone rings and despite Karl's protests that they'll be late if they pick up, Susan answers it to find that one of her staff members is ill, and she stays behind to sort out the situation. She tells Karl to go on ahead with Lyn and Joe, adding that he looks gorgeous and she'll show him how gorgeous later. Karl leaves with the Scullys. Penny tells Harold that she used to work (for a week anyway) at ‘Beefy Burgers' where Flick is currently employed. She is telling him how shocking the conditions were, then spots Darcy outside, and asks Harold if it's OK for her to duck out for a minute to speak to him. She lets Darcy know that she spoke to Karl, Darcy asks if this was wise, and it becomes evident as they talk that Darcy has completely come around to Karl's opinion of their relationship. He feels he has taken advantage of Penny, and used his position to manipulate her. He finishes by telling her they have to split up, and he's sorry. Susan has found a supply teacher and having got off the phone to her begins to rush around getting ready to go out to the calendar launch. She knocks a carton of milk off the counter, picks up the carton and puts it back in the fridge, whilst she is doing this, the phone rings again, and she runs to answer it, but her path takes her across the pool of spilt milk that she'd forgotten about. She slips and her feet go from under her, she falls heavily backwards, cracking her head on the floor. We hear a slight groan as the camera pans out to show her lying spread-eagled and probably unconscious on the lino. Karl is unimpressed to find himself not only a laughing stock, but also the only calendar model in attendance. As we hear Joe and Lyn talking it appears that Joe has also taken Karl on the scenic route past his building site to ensure maximum embarrassment on the journey to the pub. Rosie convinces Lyn to buy four calendars, Harold ducks out to get change for her, whilst Lou makes an official launch speech. 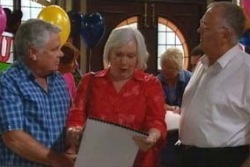 Rosie asks Karl to sign three calendars for her “to Rosie with love”, she asks where Susan is, Karl explains she'll be along in a tick. 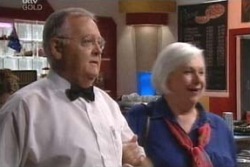 Harold walks in to find Felicity and tells her that he's been finding out about the bad conditions at ‘Beefy Burger'. He offers her a job at the Coffee Shop, she thinks it's too soon, but he persuades her to take it, by re-iterating that she needs to tackle things head on, and offers to be by her side. She accepts. A final long shot of the now clearly unconscious Susan, spilt milk at her feet.